This is the Green4U Panoz Racing GT-EV, an all-electric race car that wants to go longer than any EV has dared to run before thanks to one key trick: swappable battery packs. It’s racing legend and American Le Mans Series founder Don Panoz’s dream project, and one that he’s put aside everything else to achieve. 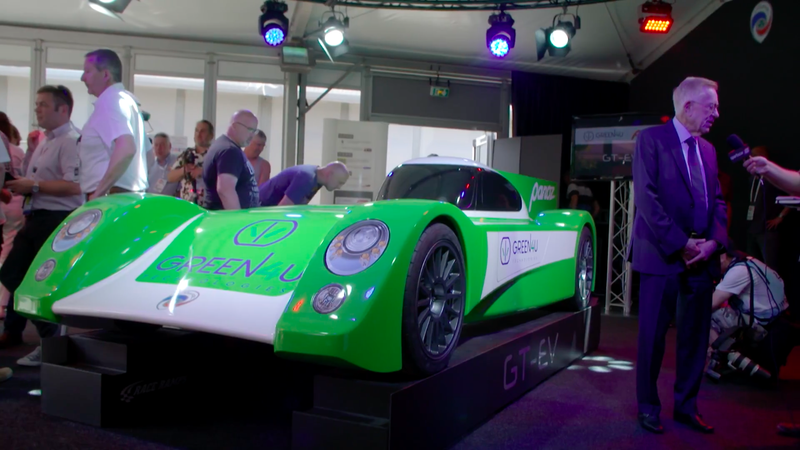 Green4U is Don Panoz’s latest venture, formed in 2016 to focus on what Panoz considers “the holy grail of racing:” an electric vehicle capable of staying on-pace with more traditional internal-combustion-powered and hybrid race cars. The Panoz Racing and DeltaWing ventures were folded under the greater Green4U company umbrella, where they continue to race the Avezzano GT4 but have put the DeltaWing on hiatus after IMSA ruled it no longer eligible to race. Panoz shifted the company’s car development focus away from their DeltaWing-inspired road car and GT racer projects in order to go after this dream EV largely because of his age: 82. He’s not getting any younger, and he for sure wants to make this EV project happen, per a Panoz representative who spoke with Jalopnik about the GT-EV. Those other projects may very well be picked up later, but the GT-EV took priority. The goal is to eventually run the new GT-EV as a Garage 56 entry—the special class the 24 Hours of Le Mans reserves for experimental technologies. It’s where the DeltaWing first debuted and ran, so it’s where Panoz wants his newest project to prove itself. Cutaway of the design so far. Currently, they’re working off of CAD renders and a wish list of design specifications: 400-450 kW (roughly 536-603 hp), a top speed between 175 and 180 mph, a regenerative braking system to harness energy back into the car, and a total weight anywhere between 2,200 and 2,750 lbs with the battery pack installed. It will be all-wheel drive powered by one electric motor powering the front wheels and another powering the rears. The chassis will be carbon fiber with an offset cockpit as well. A range of between 90 and 110 miles under race conditions will help it go the distance, with the ability to swap battery packs allowing it to—Le Mans’ usual chaos pending—finish the race. Active aerodynamics—the likes of which are coming to Le Mans’ top prototype class in 2020—will give it more downforce where needed but reduce drag on the straight to preserve the car’s power. It’s still in its earliest stages of development, so as a smaller operation, they’re still looking for partners on vital components, such as batteries and motors. There are also plans to build a two-seater street-legal sports car based on the GT-EV with a second seat behind the driver. But as with any strange Panoz project, I want to believe. If they can figure out how to swap batteries quickly, it could open up a whole new route for Le Mans cars to develop: an eerily quiet but crazy torquey one that makes me a bit excited for the crazy future cars to come.